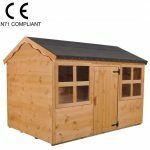 This is the top of the range model from Windsor playhouses, and so it provides a real treat for the special children in your life. Its main advantage is just how big it is, meaning that there’s lots of room for young ones to play with their favourite games, read a book, or simply let their imagination roam free. 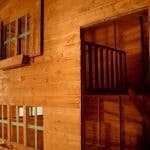 There are also two distinct levels, which is ideal if you’ve got more than one child in the playhouse at any one time. It was good to see that the internal ladder leading to the loft was solid and safe, and that the loft area itself was enclosed by a safety ladder. The window looking out from the loft area is just one of many available, and they’re all made with styrene glazing. With so much emphasis being placed, quite rightly, on health and safety it was no surprise to find that the building meets with the EN71 European toy safety standard. 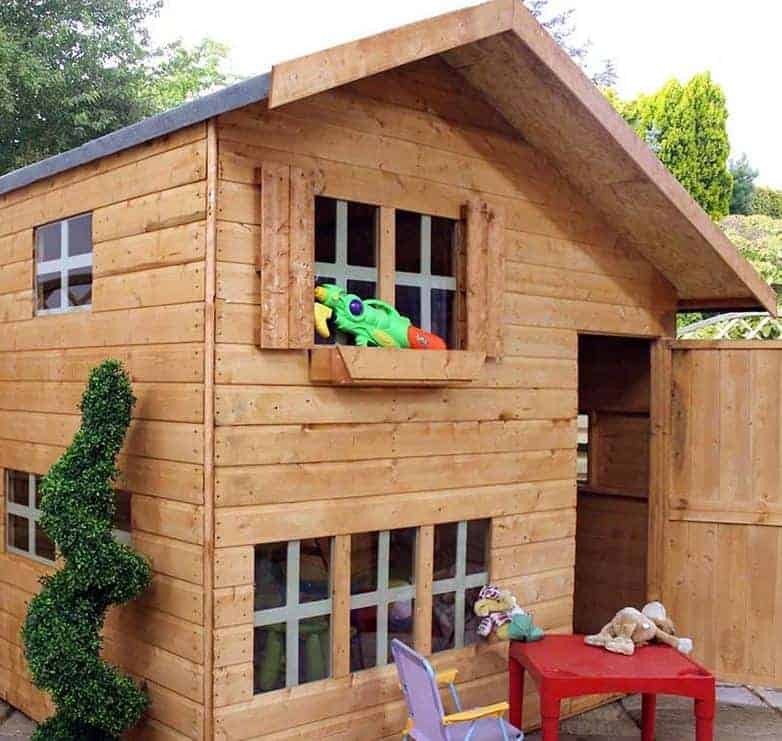 This playhouse is not only large and safe, it also has excellent weather proof properties helped by the tall apex roof among other things. It causes rain to simply bounce or run away, and the same effect is achieved by the strong tongue and groove cladding used for the walls. 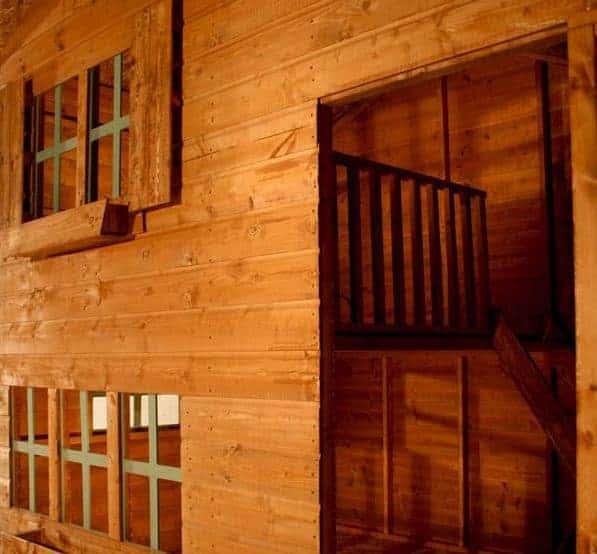 This is the largest playhouse in the Windsor range, and one of the largest of any that we’ve reviewed, and with the inclusion of two levels it’s tall as well as wide and deep. At the summit is an apex roof that’s formed from solid sheet material covered in felt. One benefit it brings is that water runs away instead of being allowed to sit on the surface, but another is that it creates a very generous ridge height of 1.88m and an eaves height of 1.22m. The external width is 2.44m and the external width is 1.80m, so there’s lots of room for your children or grandchildren, and their friends, to enjoy. With two levels there is twice as much opportunity for fun. 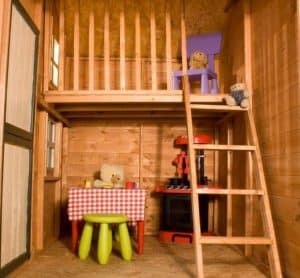 The base area can be used to store toys and games, and can easily fit in children’s furniture for a pretend tea party, while the loft area is ideal for children who want to pretend that they’re a fairytale princess or standing on some castle ramparts. 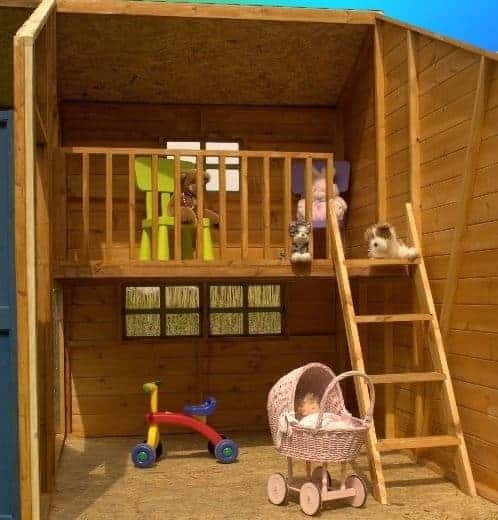 There is also a shaded area outside the playhouse that can be used for fun games in the fresh air, or simply for relaxing in the sun, thanks to the canopy effect created by the roof overhang of 0.37m. 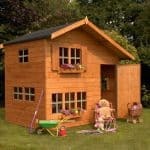 With such a large playhouse it’s vital that the cladding and frame give it strength and stability. Thankfully that’s just what we found here, thanks to the 12mm thick tongue and groove cladding that’s also very good at keeping rain out and the interior dry. The 27 X 45mm framing that accompanies it is noticeably thicker than most framing that we see on playhouses, so it feels very strong when assembled and shouldn’t have any difficulties even in windy or exposed areas. The floor is made of 10mm thick solid sheet material, which is something that we often see used on playhouses. This should be more than tough enough for its purpose but it would have been nice to see something thicker and more robust used at this price. 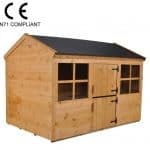 This is a top of the range playhouse with a price tag to match, so we would have expected it to come with a 10 or 15 year warranty against rot. We were disappointed, therefore, to find that a simple one year warranty was supplied, especially as this is the minimum statutory requirement. We were just as disappointed to see that a basic dip treatment had been applied as a basecoat rather than a long lasting pressure treatment. 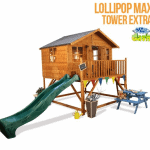 The result of this is that the customer themselves has to apply wood preserver on an annual basis, and because this playhouse is bigger than most it will also take longer to apply treatments. We were back on positive territory when we looked at the door, as it’s wider than most at 0.62m and considerably taller than most at 1.41m. This is an important consideration not only for children moving in and out, but also for parents and grandparents who will want to gain access from time to time to bring in furniture and toys and for supervision purposes. 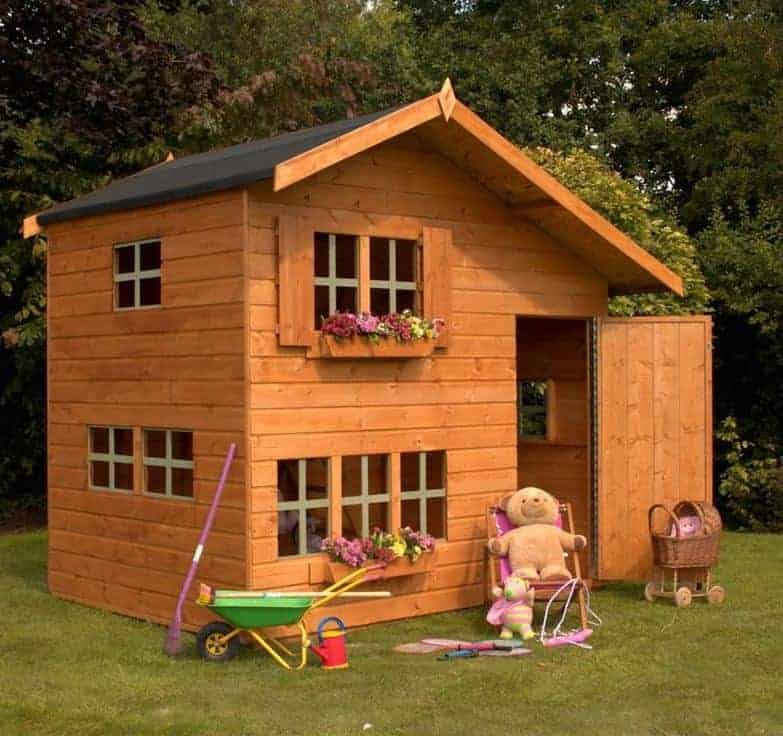 The first thing that struck us about this playhouse, apart from how large it was, is its profusion of windows. There are three on the front, including one for the loft area, and three on each side all featuring an attractive criss cross pattern. We particularly liked the addition of a window box below the loft window. It was good to see, with so many windows across the playhouse, that styrene glazing had been used throughout. It’s plastic and therefore not likely to break or shatter, and yet it can be looked through just like glass. With the use of a safety balcony on the loft area as well, an extra safeguard to accompany adult supervision, this is a building that takes safety seriously. Further evidence of this comes in its compliance with EN71 regulations for toy safety that are also applied to play equipment and playhouses. We were glad to find that a base kit can be bought for this playhouse to give it added stability and to lift it above the high and potentially damaging moisture content found at ground level. The kit itself costs a little under a hundred pounds, and there’s also an assembly service available for the base kit priced at £69.99. 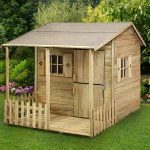 We feel that the base kit itself can easily be self assembled, and with professional assembly for the playhouse itself costing over three hundred pounds, we can imagine most buyers opting to go down the self-assembly route there as well. If required, a DIY tool kit for the assembly is available as an optional extra, as is a range of coloured treatments. 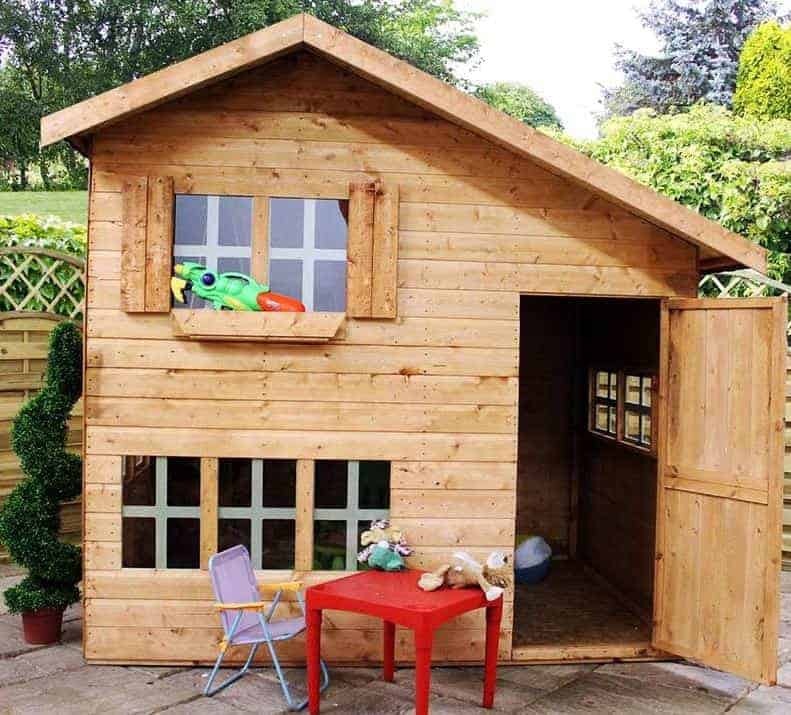 This overall quality of this playhouse was very high, although we would have liked to see thicker solid sheet material, or even tongue and groove, used for the roof and floor. This could potentially have been a very durable building, but the basic initial anti-rot treatment used will need to be topped up frequently. 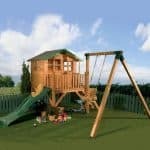 This is one of the largest timber playhouses we’ve reviewed and the second level adds even more space to play in. 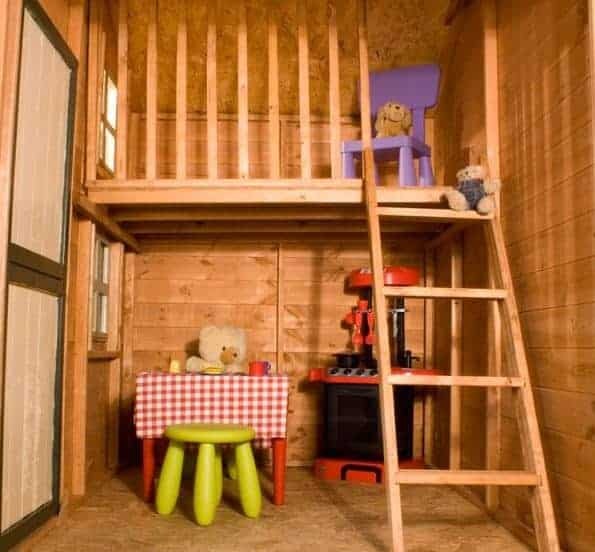 The size makes this a little more time consuming to install than most playhouses, but with a friend’s assistance it can still be completed in around five or six hours. 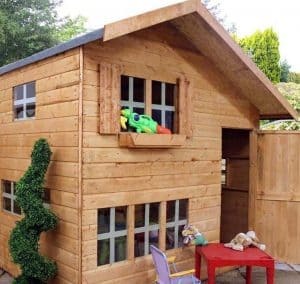 This is a large and good looking playhouse, but it’s also substantially more expensive than many that we review. 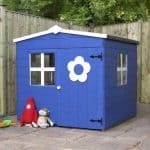 Final Thoughts: If your budget will stretch to the price tag of over six hundred pounds then this has to be worthy of consideration if you’re looking for a high quality playhouse to keep your children occupied and that will encourage their creativity and imagination. It will need a regular upkeep with preservative to keep rot at bay, and we would also recommend painting it in bright and fun colours to bring out its full beauty. The most important thing of all, however, is that it is a large and safe environment for your children or grandchildren to have a lot of fun in.